The Imperial family used regularly to spend the winter at Tsarskoe-Selo, a pretty little country town some thirteen miles south of Petrograd. It stands on a hill at the top of which is the Great Palace, a favorite residence of Catherine II. Not far away is a much more modest building, the Alexander Palace, half hidden in trees of a park studded with little artificial lakes. The Tsar Nicholas II had made it one of his regular residences ever since the tragic events of January, 1905. The Tsar and Tsarina occupied the ground floor of one wing and their children the floor above. The central block comprised state apartments and the other wing was occupied by certain members of the suite. Left; Aleksey in military uniform. It was there that I saw the Tsarevitch, Aleksey Nicolaievich, then a baby of eighteen months old, for the first time, and under the following circumstances. As usual, I had gone that day to the Alexander Palace, where my duties called me several times a week. I was just finishing my lesson with Olga Nicolaievna when the Tsarina entered the room, carrying the son and heir. She came towards us, and evidently wished to show the one member of the family I did not yet know. I couId see she was transfused by the delirious joy of a mother who last has seen her dearest wish fulfilled. She was proud and happy in the beauty of her child. The Tsarevitch was certainly one of the handsomest babies one could imagine, with his lovely fair curls and his great blue-grey eyes under their fringe of long curling lashes. He had the fresh pink colour of a healthy child, and when he smiled there were two little dimples in his chubby cheeks. When I went near him a solemn, frightened look came into his eyes, and it took a good deal to induce him to hold out a tiny hand. At that first meeting I saw the Tsarina press the little boy to her with the convulsive movement of a mother who always seems in fear of her child's life. Yet with her the caress and the look which accompanied it revealed a secret apprehension so marked and poignant that I was struck at once. I had not very long to wait to know its meaning. During the years following I had increasing opportunities of seeing Aleksey Nicolaievich, who made a practice of escaping from his sailor nurse and running into his sisters' schoolroom, from which he was soon fetched. And yet at times his visits would suddenly cease, and for quite a considerable period he was seen no more, Every time he disappeared everyone in the palace was smitten with the greatest depression. My pupils betrayed it in a mood of melancholy they tried in vain to conceal. When I asked them the cause, they answered evasively that Aleksey Nicolaievich was not well. I knew from other sources that he was a prey to a disease which was only mentioned inferentially and the nature of which no one ever told me. As I have already said, when I was released from my duties as tutor to Duke Sergei of Leuchtenberg in 1909 I could give more time to the Grand-Duchesses. I lived in St. Petersburg and visited Tsarskoe-Selo five times a week. Although the number of lessons I gave had considerably increased, my pupils made but slow progress, largely because the Imperial family spent months at a time in the Crimea. I regretted more and more that they had not been given a French governess, and each time they returned I always found they had forgotten a good deal. Mademoiselle Tutcheva, their Russian governess, could not do everything, for all her intense devotion and perfect knowledge of languages. It was with a view to overcoming this difficulty that the Tsarina asked me to accompany the family when they left Tsarskoe-Selo for a considerable time. My first visit under the new dispensation was to the Crimea in the autumn of 1911. I lived in the little town of Yalta, with my colleague, M. Petrov, professor of Russian, who had also been asked to continue his course of teaching. We went to Livadia every day to give our lessons. Above; Aleksey and his spaniel Joy on a balcony at Livadia. The kind of life we led was extremely agreeable, for out of working hours we were absolutely free, and could enjoy the beautiful climate of the "Russian Riviera" without having to observe the formalities of Court life. In the spring of the following year the family again spent several months in the Crimea. M. Petrov and I were lodged in a little house in the park of Livadia. We took our meals with some of the officers and officials of the Court, only the suite and a few casual visitors being admitted to the Imperial luncheon-table. In the evening the family dined quite alone. A few days after our arrival, however, as the Tsarina wished (as I subsequently ascertained) to give a delicate proof of her esteem for those to whom she was entrusting the education of her children, she instructed the Court Chamberlain to invite us to the Imperial table. I was highly gratified by the feelings which had prompted this kindness, but these meals meant a somewhat onerous obligation, at any rate at the start, although Court etiquette was not very exacting in ordinary times. My pupils, too, seemed to get tired of these long luncheons, and we were all glad enough to get back to the schoolroom to our afternoon lessons and simple, friendly relations. I seldom saw Aleksey Nicolaievich. He almost always took his meals with the Tsarina, who usually stayed in her own apartments. On June 10th we returned to Tsarskoe-Selo, and shortly afterwards the Imperial family went to Peterhof, from which they proceeded to their annual cruise in the fjords of Finland on the Standard. At the beginning of September, 19I2, the family left for the Forest of Bielovesa (An Imperial sporting estate in the Government of Grodno. This forest and the Caucasus are the only places where the aurochs, or European bison, is found. They still rove these immense forests, which occupy an area of more than three thousand acres. ), where they spent a fortnight, and then proceeded to Spala (An ancient hunting-seat of the kings of Poland. ), for a longer visit. M. Petrov and I joined them there at the end of September. Shortly after my arrival the Tsarina told me she wanted me to take Aleksey Nicolaievich also. I gave him the first lesson on October 2nd in the presence of his mother. The child was then eight and a half. He did not know a word of French, and at first I had a good deal of difficulty. My lessons were soon interrupted, as the boy, who had looked to me ill from the outset, soon had to take to his bed. Both my colleague and myself had been struck by his lack of colour and the fact that he was carried as if he could not walk(He was generally carried by Derevenko, formerly a sailor on the Imperial yacht Standard, to whom this duty had been assigned several years before). The disease from which he was suffering had evidently taken a turn for the worse. A few days later it was whispered that his condition was, giving rise to extreme anxiety, and that Professors Rauchfuss and Feodorov had been summoned from St. Petersburg. Yet life continued as before; one shooting-party succeeded another, and the guests were more numerous than ever. One evening after dinner the Grand-Duchesses Marie and Anastasia Nicolaievna gave two short scenes from the Bourgeois Gentilhomme in the dining-room before Their Majesties, the suite, and several guests. I was the prompter, concealed behind a screen which did duty for the wings. By craning my neck a little I could see the Tsarina in the front row of the audience smiling and talking gaily to her neighbors. When the play was over I went out by the service door and found myself in the corridor opposite Aleksey Nicolaievich's room, from which a moaning sound came distinctly to my ears. I suddenly noticed the Tsarina running up, holding her long and awkward train in her two hands. I shrank back against the wall, and she passed me without observing my presence. There was a distracted and terror-stricken look in her face. I returned to the dining-room. The scene was of the most animated description. Footmen in livery were handing round refreshments on salvers. Everyone was laughing and exchanging jokes. The evening was at its height. A few minutes later the Tsarina came back. She had resumed the mask and forced herself to smile pleasantly at the guests who crowded round her. But I had noticed that the Tsar, even while engaged in conversation, had taken up a position from which he could watch the door, and I caught the despairing glance which the Tsarina threw him as she came in. An hour later I returned to my room, still thoroughly upset at the scene which had suddenly brought home to me the tragedy of this double life. Yet, although the invalid's condition was still worse, life had apparently undergone no change. All that happened was that we saw less and less of the Tsarina. The Tsar controlled his anxiety and continued his shooting-parties, while the usual crowd of guests appeared at dinner every evening. On October 17th Professor Feodorov arrived from St. Petersburg at last. I caught sight of him for a moment in the evening. He looked very worried. The next day was Aleksey Nicolaievich's birthday. Apart from a religious service, there was nothing to mark the occasion. Everyone followed Their Majesties' example and endeavoured to conceal his or her apprehensions. On October 19th the fever was worse, reaching 102-50 in the morning and 103-3' in the evening. 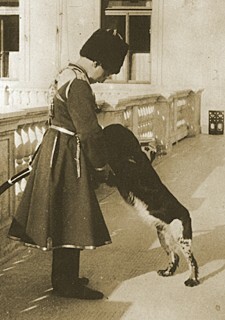 During dinner the Tsarina had Professor Feodorov fetched. On Sunday, October 20th, the patient's condition was still worse There were, however, a few guests at luncheon. The next day, as the Tsarevitch's temperature went up to 1050 and the heart was very feeble, Count Fredericks asked the Tsar's permission to publish bulletins. The first was sent to St. Petersburg the same evening. Above; Alexandra and Aleksey at Spala. 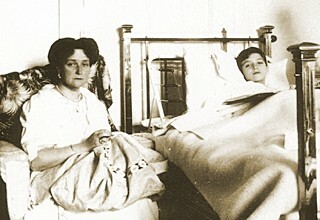 Thus the intervention of the highest official at Court had been necessary before the decision to admit the gravity of the Tsarevitch's condition was taken. Why did the Tsar and Tsarina subject themselves to this dreadful ordeal? Why, when their one desire in life was to be with their suffering son, did they force themselves to appear among their guests with a smile on their lips ? The reason was that they did not wish the world to know the nature of the Heir's illness, and, as I knew myself, regarded it in the light of a state secret. On the morning of October 22nd the child's temperature was 103-5. About midday, however, the pains gradually subsided, and the doctors could proceed to a more thorough examination of the invalid, who had hitherto refused to allow it on account of his terrible sufferings. At three o'clock in the afternoon there was a religious service in the forest. It was attended by a large number of peasants from the surrounding districts. Beginning on the previous day, prayers for the recovery of the Heir were said twice a day. As there was no church at Spala, a tent with a small portable altar had been erected in the park as soon as we arrived. The priest officiated there morning and night. After a few days, during which we were all a prey to the most terrible apprehensions, the crisis was reached and passed, and the period of convalescence began. It was a long and slow business, however, and we could feel that, notwithstanding the change for the better, there was still cause for anxiety. As the patient's condition required constant and most careful watching, Professor Feodorov had sent for Dr. Vladimir Derevenko (He had the same surname as Derevenko, the sailor whom I have mentioned above. A constant cause of confusion), one of his young assistants, from St. Petersburg. This gentleman henceforth remained in constant attendance on the Tsarevitch. The newspapers about this time had a good deal to say of the young Heir's illness-and the most fantastic stories were going round. I only had the truth some time later, and then from Dr. Derevenko himself. The crisis had been brought on by a fall of Aleksey Nicolaievich at Bielovesa. In trying to get out of a boat he had hit his left thigh on the side, and the blow had caused rather profuse internal haemorrhage. He was just getting better when some imprudence at Spala suddenly aggravated his condition. A sanguineous tumour formed in the groin and nearly produced a serious infection. On November 16th it was possible to think of removing the child, without too great danger of relapse but with extreme care, from Spala to Tsarskoe-Selo, where the Imperial family passed the entire winter. Aleksey Nicolaievich's condition required assiduous and special medical attention. His illness at Spala had left behind it a temporary atrophy of the nerves of the left leg, which remained drawn up and could not be straightened out by the boy himself. Massage and orthopedic appliances were necessary, but in time these measures brought the limb back to its normal position. It is hardly necessary to say that under these circumstances I could not even think of resuming my work with the Tsarevitch. This state of things lasted until the summer holidays of 1913. I was in the habit of visiting Switzerland every summer. That year the Tsarina informed me a few days before I left that on my return she proposed to appoint me tutor to Aleksey Nicolaievich, The news filled me with a mingled sense of pleasure and apprehension. I was delighted at the confidence shown in me, but nervous of the responsibility it involved. Yet I felt I had no right to try and escape the heavy task assigned to me, as circumstances might enable me to exercise some influence, however slight, on the intellectual development of the boy who would one day be the ruler of one of the mightiest states of Europe.